A model of the differential responses to IFN-γ of ODCs during their differentiation. The schematic shows the response of ODCs, at 2 different stages of development, to IFN-γ delivered to the CNS before EAE onset in mice. Low constitutive protein production allows mature ODCs (top left) to survive the increase in ER stress that is associated with the initial interaction with IFN-γ (bottom left). 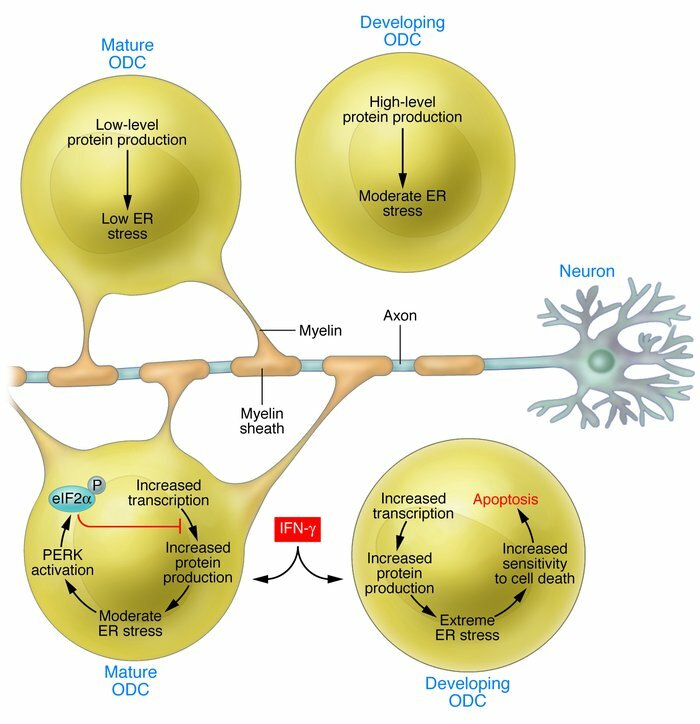 Having survived the original stressor, mature ODCs induce activation of PERK. PERK activation in turn induces eIF2α phosphorylation, ultimately allowing ODCs to acquire resistance to further ER stress. The acquired resistance to ER stress protects cells from apoptotic mechanisms associated with EAE, allowing the cells to maintain functional myelin sheaths and concomitantly reducing clinical symptoms observed in MS. In contrast, a high level of constitutive protein production in developing ODCs (top right) results in toxic levels of ER stress following IFN-γ treatment (bottom right), resulting in an increased risk of apoptosis in developing ODCs.